The actual planning of the operation took very little time, and this was principally because so few people were involved in it. The man with the money, a flamboyant redneck prophet named Jeremiah Dogan, was at the time the Imperial Wizard for the Klan in Mississippi. His predecessor had been loaded off to prison, and Jerry Dogan was having a wonderful time orchestrating the bombings. He was not stupid. In fact, the FBI later admitted Dogan was quite effective as a terrorist because he delegated the dirty work to small, autonomous groups of hit men who worked completely independent of one another. The FBI had become expert at infiltrating the Klan with informants, and Dogan trusted no one but family and a handful of accomplices. He owned the largest used car lot in Meridian, Mississippi, and had made plenty of money on all sorts of shady deals. He sometimes preached in rural churches. he found fifteen sticks of dynamite, three blasting caps, and a fuse. He drove into town and waited in an all-night café. At precisely 2 A.M., the third member of the team walked into the crowded truck stop and sat across from Sam Cayhall. His name was Rollie Wedge, a young man of no more than twenty-two, but a trusted veteran of the civil rights war. He said he was from Louisiana, now lived somewhere in the mountains where no one could find him, and though he never boasted, he had told Sam Cayhall several times that he fully expected to be killed in the struggle for white supremacy. His father was a Klansman and a demolition contractor, and from him Rollie had learned how to use explosives. They drove by Kramer's office for the first time around 4 A.M. The street was deserted, and dark, and Rollie said something to the effect that this would be their easiest job yet. "Too bad we can't bomb his house," Rollie said softly as they drove by the Kramer home. "Yeah. Too bad," Sam said nervously. "But he's got a guard, you know." "Yeah, I know. But the guard would be easy." "Yeah, I guess. But he's got kids in there, you know." "Kill 'em while they're young," Rollie said. "Little Jew bastards grow up to be big Jew bastards." Cayhall parked the car in an alley behind Kramer's office. He turned off the ignition, and both men quietly opened the trunk, removed the box and the bag, and slid along a row of hedges leading to the rear door. Sam Cayhall jimmied the rear door of the office and they were inside within seconds. Two weeks earlier, Sam had presented himself to the receptionist under the ruse of asking for directions, then asked to use the rest room. In the main hallway, between the rest room and what appeared to be Kramer's office, was a narrow closet filled with stacks of old files and other legal rubbish. "Stay by the door and watch the alley," Wedge whispered coolly, and Sam did exactly as he was told. He preferred to serve as the watchman and avoid handling the explosives. Rollie quickly sat the box on the floor in the closet, and wired the dynamite. It was a delicate exercise, and Sam's heart raced each time as he waited. His back was always to the explosives, just in case something went wrong. They were in the office less than five minutes. Then they were back in the alley strolling nonchalantly to the green Pontiac. They were becoming invincible. It was all so easy. They had bombed a real estate office in Jackson because the realtor had sold a house to a black couple. A Jewish realtor. They had bombed a small newspaper office because the editor had uttered something neutral on segregation. They had demolished a Jackson synagogue, the largest in the state. They drove through the alley in the darkness, and as the green Pontiac entered a side street its headlights came on. In each of the prior bombings, Wedge had used a fifteen-minute fuse, one simply lit with a match, very similar to a firecracker. And as part of the exercise, the team of bombers enjoyed cruising with the windows down at a point always on the outskirts of town just as the explosion ripped through the target. They had heard and felt each of the prior hits, at a nice distance, as they made their leisurely getaways. But tonight would be different. Sam made a wrong turn somewhere, and suddenly they were stopped at a railroad crossing staring at flashing lights as a freighter clicked by in front of them. A rather long freight train. Sam checked his watch more than once. Rollie said nothing. The train passed, and Sam took another wrong turn. They were near the river, with a bridge in the distance, and the street was lined with run-down houses. Sam checked his watch again. The ground would shake in less than five minutes, and he preferred to be easing into the darkness of a lonely highway when that happened. Rollie fidgeted once as if he was becoming irritated with his driver, but he said nothing. Another turn, another new street. Greenville was not that big a city, and if he kept turning Sam figured he could work his way back to a familiar street. The next wrong turn proved to be the last. Sam hit the brakes as soon as he realized he had turned the wrong way on a one-way street. And when he hit the brakes, the engine quit. He yanked the gearshift into park, and turned the ignition. The engine turned perfectly, but it just wouldn't start. Then, the smell of gasoline. "Dammit!" Sam said through clenched teeth. "Dammit!" Rollie sat low in his seat and stared through the window. "Dammit! It's flooded!" He turned the key again, same result. "Don't run the battery down," Rollie said slowly, calmly. Sam was near panic. Though he was lost, he was reasonably sure they were not far from downtown. He breathed deeply, and studied the street. He glanced at his watch. There were no other cars in sight. All was quiet. It was the perfect setting for a bomb blast. He could see the fuse burning along the wooden floor. He could feel the jarring of the ground. He could hear the roar of ripping wood and sheetrock, brick and glass. Hell, Sam thought as he tried to calm himself, we might get hit with debris. "You'd think Dogan would send a decent car," he mumbled to himself. Rollie did not respond, just kept his gaze on something outside his window. At least fifteen minutes had passed since they had left Kramer's office, and it was time for the fireworks. Sam wiped rows of sweat from his forehead, and once again tried the ignition. Mercifully, the engine started. He grinned at Rollie, who seemed completely indifferent. He backed the car a few feet, then sped away. The first street looked familiar, and two blocks later they were on Main Street. "What kind of fuse did you use?" Sam finally asked, as they turned onto Highway 82, less than ten blocks from Kramer's office. Rollie shrugged as if it was his business and Sam shouldn't ask. They slowed as they passed a parked police car, then gained speed on the edge of town. Within minutes, Greenville was behind them. "What kind of fuse did you use?" Sam asked again with an edge to his voice. "I tried something new," Rollie answered without looking. "You wouldn't understand," Rollie said, and Sam did a slow burn. "A timing device?" he asked a few miles down the road. THEY DROVE to Cleveland in complete silence. For a few miles, as the lights of Greenville slowly disappeared across the flat land, Sam half-expected to see a fireball or hear a distant rumble. Nothing happened. Wedge even managed to catch a little nap. The truck stop café was crowded when they arrived. As always, Rollie eased from his seat and closed the passenger door. "Until we meet again," he said with a smile through the open window, then walked to his rental car. Sam watched him swagger away, and marveled once more at the coolness of Rollie Wedge. It was by now a few minutes after five-thirty, and a hint of orange was peeking through the darkness to the east. Sam pulled the green Pontiac onto Highway 61, and headed south. THE HORROR of the Kramer bombing actually began about the time Rollie Wedge and Sam Cayhall parted ways in Cleveland. It started with the alarm clock on a nightstand not far from Ruth Kramer's pillow. When it erupted at five-thirty, the usual hour, Ruth knew instantly that she was a very sick woman. She had a slight fever, a vicious pain in her temples, and she was quite nauseous. Marvin helped her to the bathroom not far away where she stayed for thirty minutes. A nasty flu bug had been circulating through Greenville for a month, and had now found its way into the Kramer home. The maid woke the twins, Josh and John, now five years old, at six-thirty, and quickly had them bathed, dressed, and fed. Marvin thought it best to take them to nursery school as planned and get them out of the house and, he hoped, away from the virus. He called a doctor friend for a prescription, and left the maid twenty dollars to pick up the medication at the pharmacy in an hour. He said good-bye to Ruth, who was lying on the floor of the bathroom with a pillow under her head and an icepack over her face, and left the house with the boys. Not all of his practice was devoted to civil rights litigation; there was not enough of that to survive on in Mississippi in 1967. He handled a few criminal cases and other generic civil matters: divorces, zoning, bankruptcy, real estate. And despite the fact that his father barely spoke to him, and the rest of the Kramers barely uttered his name, Marvin spent a third of his time at the office working on family business. On this particular morning, he was scheduled to appear in court at 9 A.M. to argue a motion in a lawsuit involving his uncle's real estate. The twins loved his law office. They were not due at nursery school until eight, so Marvin could work a little before delivering the boys and heading on to court. This happened perhaps once a month. In fact, hardly a day passed without one of the twins begging Marvin to take them to his office first and then to nursery school. eaming about for eighteen months. Upstairs on the second floor were the cramped offices of another lawyer and two secretaries. The third floor had no heat or air conditioning, and was used for storage. He normally arrived at the office between seven-thirty and eight because he enjoyed a quiet hour before the rest of the firm arrived and the phone started ringing. As usual, he was the first to arrive on Friday, April 21. He unlocked the front door, turned on the light switch, and stopped in the foyer. He lectured the twins about making a mess on Helen's desk, but they were off down the hallway and didn't hear a word. Josh already had the scissors and John the stapler by the time Marvin stuck his head in for the first time and warned them. He smiled to himself, then went to his office where he was soon deep in research. At about a quarter to eight, he would recall later from the hospital, Marvin climbed the stairs to the third floor to retrieve an old file which, he thought at the time, had some relevance to the case he was preparing. He mumbled something to himself as he bounced up the steps. As things evolved, the old file saved his life. The boys were laughing somewhere down the hall. The blast shot upward and horizontally at several thousand feet per second. Fifteen sticks of dynamite in the center of a wooden framed building will reduce it to splinters and rubble in a matter of seconds. It took a full minute for the jagged slivers of wood and other debris to return to earth. The ground seemed to shake like a small earthquake, and, as witnesses would later describe, bits of glass sprinkled downtown Greenville for what seemed like an eternity. Josh and John Kramer were less than fifteen feet from the epicenter of the blast, and fortunately never knew what hit them. They did not suffer. Their mangled bodies were found under eight feet of rubble by local firemen. Marvin Kramer was thrown first against the ceiling of the third floor, then, unconscious, fell along with the remnants of the roof into the smoking crater in the center of the building. He was found twenty minutes later and rushed to the hospital. Within three hours, both legs were amputated at the knees. The time of the blast was exactly seven forty-six, and this in itself was somewhat fortunate. Helen, Marvin's secretary, was leaving the post office four blocks away and felt the blast. Another ten minutes, and she would have been inside making coffee. David Lukland, a young associate in the law firm, lived three blocks away, and had just locked his apartment door when he heard and felt the blast. Another ten minutes, and he would've been picking through his mail in his second-floor office. A small fire was ignited in the office building next door, and though it was quickly contained it added greatly to the excitement. The smoke was heavy for a few moments, and this sent people scurrying. There were two injuries to pedestrians. A three-foot section of a two-by-four landed on a sidewalk a hundred yards away, bounced once, then hit Mrs. Mildred Talton square in the face as she stepped away from her parked car and looked in the direction of the explosion. She received a broken nose and a nasty laceration, but recovered in due course. The second injury was very minor but very significant. A stranger by the name of Sam Cayhall was walking slowly toward the Kramer office when the ground shook so hard he lost his footing and tripped on a street curb. As he struggled to his feet, he was hit once in the neck and once in the left cheek by flying glass. He ducked behind a tree as shards and pieces rained around him. He gaped at the devastation before him, then ran away. Blood dripped from his cheek and puddled on his shirt. He was in shock and did not remember much of this later. Driving the same green Pontiac, he sped away from downtown, and would most likely have made it safely from Greenville for the second time had he been thinking and paying attention. Two cops in a patrol car were speeding into the business district to respond to the bombing call when they met a green Pontiac which, for some reason, refused to move to the shoulder and yield. The patrol car had sirens blaring, lights flashing, horns blowing, and cops cursing, but the green Pontiac just froze in its lane of traffic and wouldn't budge. The cops stopped, ran to it, yanked open the door, and found a man with blood all over him. Handcuffs were slapped around Sam's wrists. He was shoved roughly into the rear seat of the police car, and taken to jail. The Pontiac was impounded. THE BOMB that killed the Kramer twins was the crudest of sorts. Fifteen sticks of dynamite wrapped tightly together with gray duct tape. But there was no fuse. Rollie Wedge had used instead a detonating device, a timer, a cheap windup alarm clock. He had removed the minute hand from the clock, and drilled a small hole between the numbers seven and eight. Into the small hole he had inserted a metal pin which, when touched by the sweeping hour hand, would complete the circuit and detonate the bomb. Rollie wanted more time than a fifteen-minute fuse could provide. Plus, he considered himself an expert and wanted to experiment with new devices. Perhaps the hour hand was warped a bit. Perhaps the dial of the clock was not perfectly flat. Perhaps Rollie in his enthusiasm had wound it too tight, or not tight enough. Perhaps the metal pin was not flush with the dial. It was, after all, Rollie's first effort with a timer. Or perhaps the timing device worked precisely as planned. But whatever the reason or whatever the excuse, the bombing campaign of Jeremiah Dogan and the Ku Klux Klan had now spilled Jewish blood in Mississippi. And, for all practical purposes, the campaign was over. "Mesmerizing... with an authority and originality... and with a grasp of literary complexity that makes Scott Turow's novel's pale by comparison -- Grisham returns." -- San Francisco Chronicle. 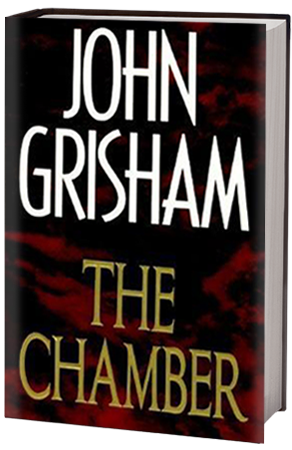 "A dark and thoughtful tale pulsing with moral uncertainties... Grisham is at his best." --People. "Compelling... Powerful... The Chamber will make readers think long and hard about the death penalty." -- USA Today. "His best yet." -- The Houston Post.